This video installation, “Unsubtitled”, was a significant event in Vietnam on a few levels. First, it might have been the most complicated, technologically speaking, art event yet in the country. With more than 20 apple laptops and numerous projectors utilizing specialized software the needed coordination was almost unimaginable for the local production team. On top of this fact was the most important feature of the project – the sophistication and intelligence of the concept behind the artwork. 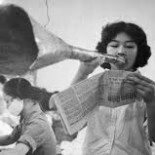 Nguyen Trinh Thi simply showed regular, typical “ordinary” Vietnamese people standing and eating – brilliant, disarming, funny, warm and powerful. Of course, all is not as it appears in the art world, especially the Vietnamese one. The so-called ordinary people were not ordinary at all – art stars, cultural legends and “heavy locals” were the 20 people in the video. It was an endless loop of these people eating various local Vietnamese fair (like carrots, bread, cucumber, fruit, sweet cakes, etc.) and even smoking cigarettes. Thi used large life-sized cutouts sheets of MDF board to accommodate the projected figures. They had to be large enough to show normal movement of eating (or smoking) with the hands moving, etc. The low ceiling of the large room helped contain the blacked out background that was necessary for the full effect of these “eating people”. Everyone wore “regular” clothes and appeared as if they had just been hustled in off the street and ushered into this live performance. Only it wasn’t live as live as it seemed, and it really did appear “live”. Golden kudos to Thi and the large supportive production team that pulled this off. An accomplished and multi-talented artist, Jamie Maxtone-Graham, was the cameraman behind the lens of all the projectors – all 10 of them (some of them multi-tasking with 2-3 people at once). It was a miracle that this all worked – to the audience it all seemed fine, no worries at all – looked good, smelled good, tasted good. Because of the bright shiny lure of “new media” artwork in Vietnam (not new by the way at all in the rest of the world for some time now), it seems like everyone and their little brother is doing video and/or performance. Most of it poorly conceived and sloppily executed – yawn. And all it apppears self-indulgent, in love with itself and always, always going on for too long. Also this video/performance form seems to attract the less talented in the pool of potential talent. Not so this time with “Unsubtitled”. Nope. “The Wizard of Oz”, behind the velvet curtain pulling the levers and pushing all the buttons, Thi was there and not there. Irony was in abundance as the artist took the care to issue the following brief explanation/statement about the work, “Eating needs no explanation”. It was as if her intent was to “demystify” the conceptual basis for the artwork in the first place. After all, it was obviously intended as an “artwork” as the viewing context was pure art world; the people participating in the production were all artists themselves or somehow directly connected to “art practice” in some form (in fact, they were all from the tightly knit “Nha San” community). All this background information proved much less important than the success of the actual viewing of the endless loop of the people eating. Nguyen Trinh Thi, whatever she is – filmmaker, artist, academic, teacher, mother, wife – hit the mark with this one. “Unsubtitled” was simple, direct, universal and humorous – soul food for the soulful, crumbs and all.